Need a quick side dish for your next dinner party?! Look no further my friends! 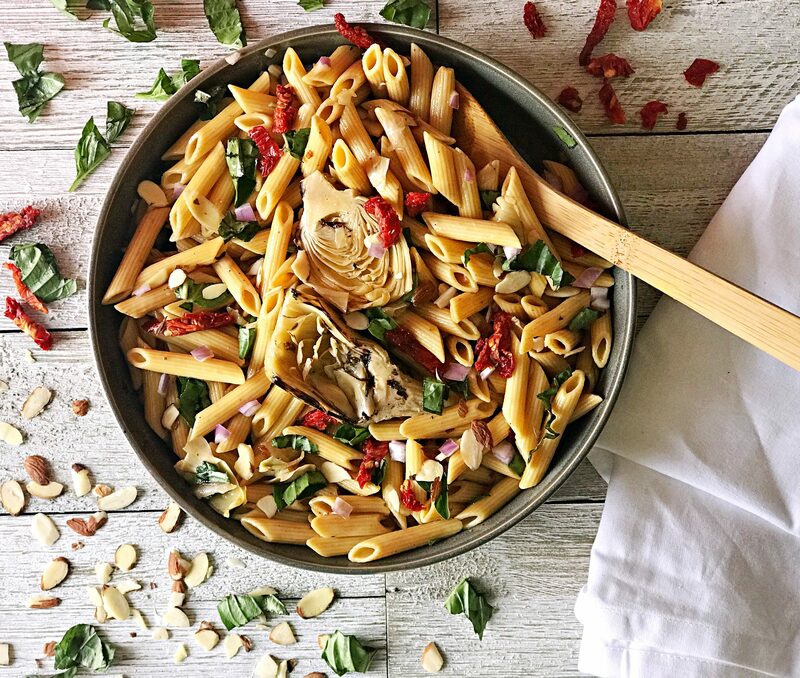 The longest part of making this pasta salad is just waiting for the pasta to cook ( and if you like your pasta al dente, then you don’t even have to wait the full time on that)! I love this pasta salad, because the dressing and mediterranean veggies give this it a fresh and light flavor. 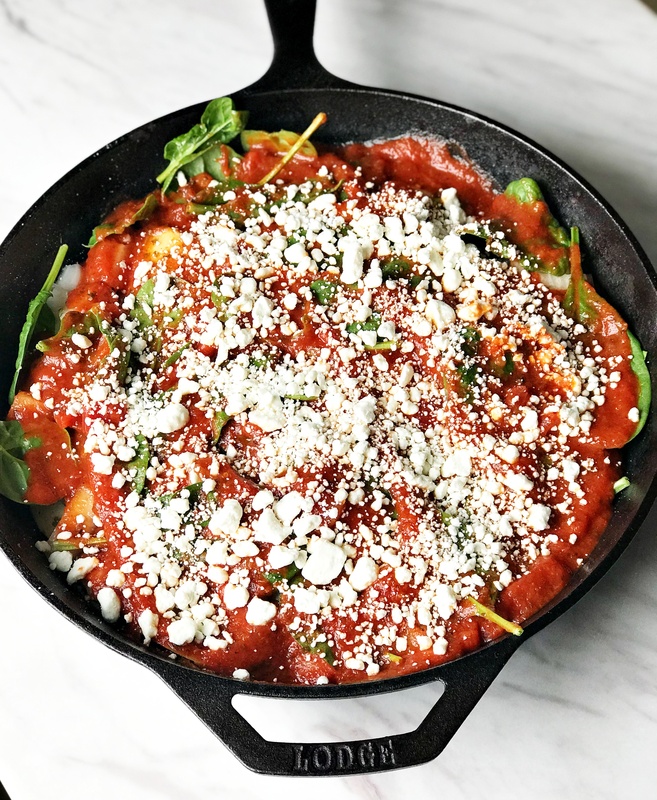 Although this recipe doesn’t call for cheese, don’t be afraid to add some goat or feta cheese if you really want to take it to the next level! In order to make the best use of your time, chop veggies and prepare the dressing while pasta is cooking. Dump all ingredients into a large mixing bowl, and then stir in dressing right before serving (to avoid getting everything too soggy). 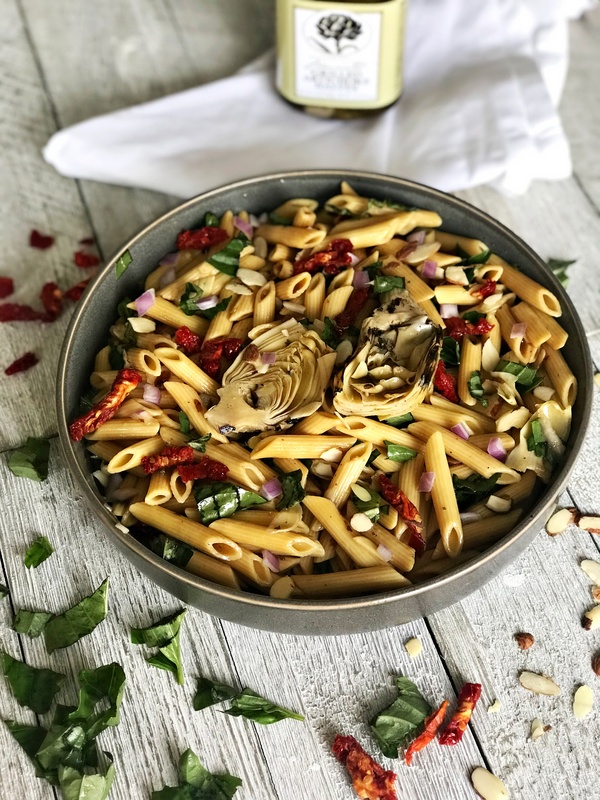 For this recipe, I used Banza Pasta, a gluten free alternative to regular wheat pasta, so I wouldn’t feel all that guilty going back for a second serving! 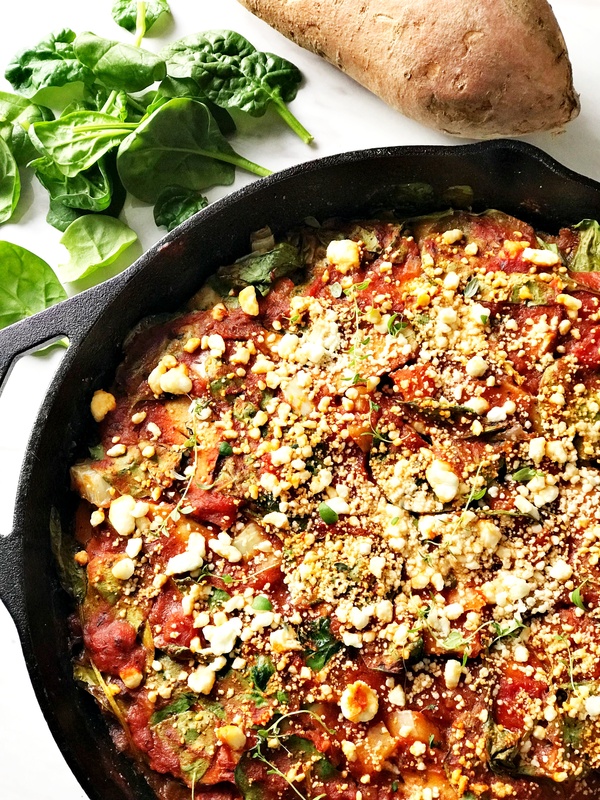 You could really add any of your favorite mediterranean inspired veggies…my opinion is, the more the merrier! For me…nothing beats fresh chopped basil (cue romantic background music). 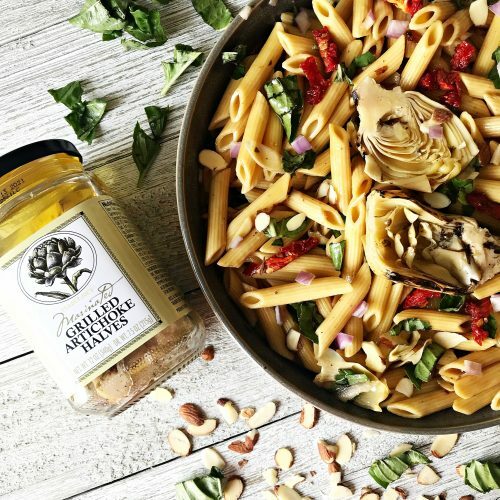 Sun-dried tomatoes add a deep savory flavor, while grilled artichoke hearts give it an awesome salty and smoky flavor. Add any sort of nut for crunch (a good crunch in any dish is a totally underrated quality) and call it a day! The dressing is super easy, just a combination of 2 parts extra virgin olive oil, mixed with 1 part balsamic vinegar, along with dried Italian spices. If you’re feeling really fancy and have lemons on deck…don’t be afraid to throw some of that in too! I think the best thing about this dish is that it looks super fancy, but really only requires you to have the right ingredients on hand, that can then be dumped in a bowl and mixed together. Give it a try, you guys will love it! 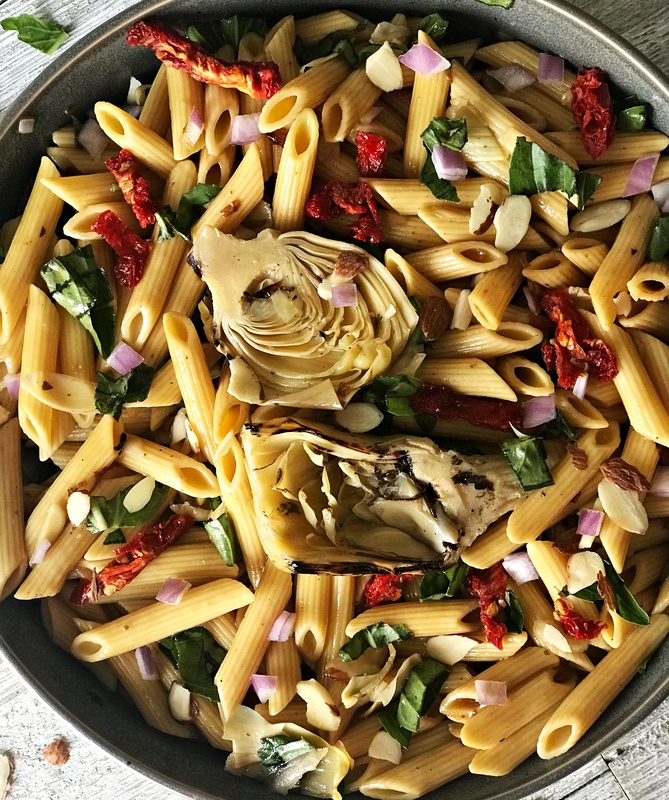 Gluten free pasta filled with basil, sun-dried tomatoes, artichokes, and onion! Mixed with a homemade balsamic vinaigrette and packed with vitamins, flavor, and healthy oils! Cook pasta on stove top until soft, then rinse under cool water. Transfer pasta to large bowl. Add remaining ingredients and mix well. Add goat cheese or feta for added flavor! Everyone please give a round of applause for this recipe, as it hails all the way from my homeland…New Jersey! 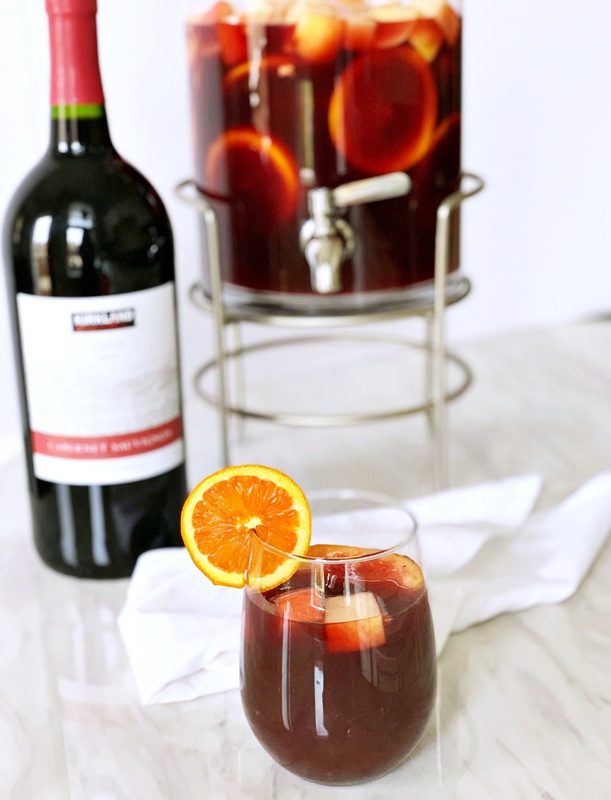 I have to admit, I tried it for the first time in Ohio when my Jersey-native friend Kristen blessed us with her mom’s sangria one fine evening, and let me tell you…this baby packs a delightful punch (as we soon found out)! But for real, make this for any outdoor gathering and you’ll be MVC (most valuable contributor)! And to make matters even better, this recipe is oh-so-easy. The key is to get high quality orange juice. You can freshly squeeze it yourself, or buy a 100% juice with oranges as the only ingredient listed. Where you can save some cash money is on the liquor. No need to go for top shelf liquor, a decently priced brandy, triple sec, and wine will do the trick. I like to use the Costco Kirkland brand Cabernet because it gets you some serious bang for your buck! The morning of, chop up your fruit and add to a tupperware pitcher or large container. Take equal parts (i.e. 1 cup) brandy, triple sec, orange juice, and pour in with the fruit. Stir and let sit in fridge. Before serving, transfer to a large pitcher and mix in wine. Fruit soaking in brandy, triple sec, and orange juice. 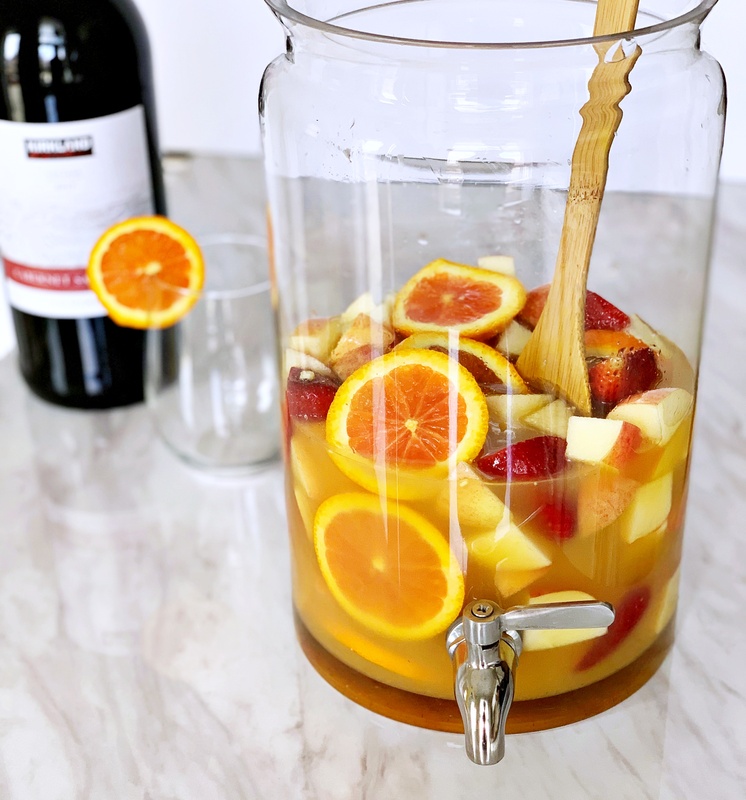 Can I make this sangria with white wine? Absolutely! Keep everything else the same, just substitute red for white. Pinot Grigio is a great option for white! 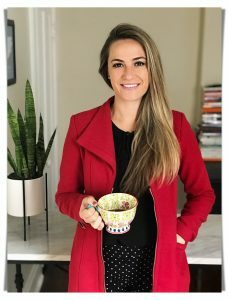 Does it matter what fruit I use? I’d say to go for whatever fruit makes you happy! I think orange slices complement the OJ nicely (and they look pretty), I love strawberries, and apples are inexpensive. 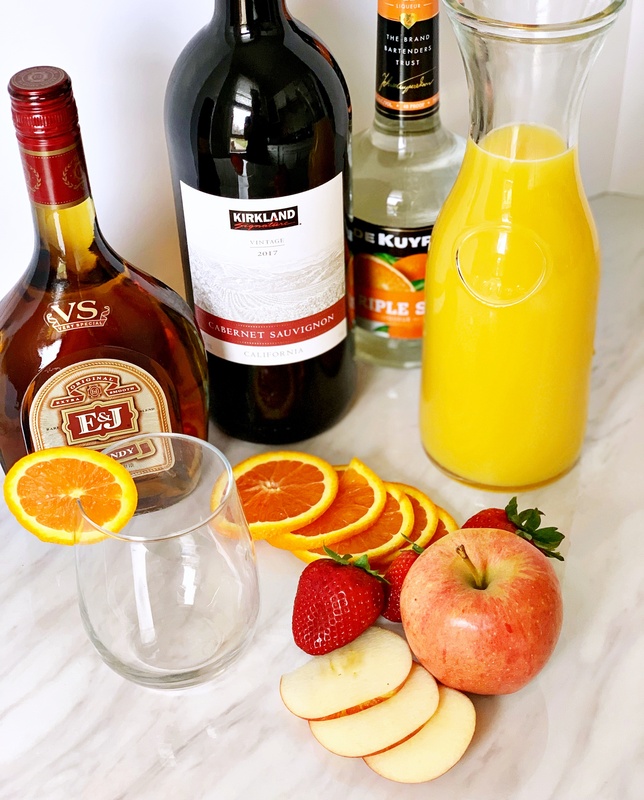 Now that my sangria brain is firing on all cylinders…you could do a Caribbean vibe and go with some kiwi, mango, or pineapple with a white sangria (ohhhh that sounds yummy)! If I take this to someone else’s house, I usually bring a double batch in my serving pitcher, and then fill a tupperware pitcher with fruit and liquor, and then my extra bottle of wine in tow. You know…for refills! I hope you guys have as much fun making this as you do drinking it…enjoy! 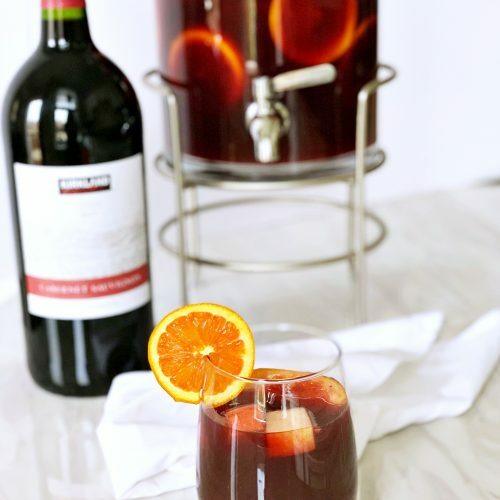 A red wine Sangria filled with fruit, brandy, triple sec, and high quality orange juice! Great to bring to any backyard party, and sure to get the party started! Chop all of your fruit and add it to a large pitcher. Pour in brandy, triple sec, and orange juice. Let the liquors and OJ soak in the fruit until ready to serve. Once ready to serve, stir in wine. 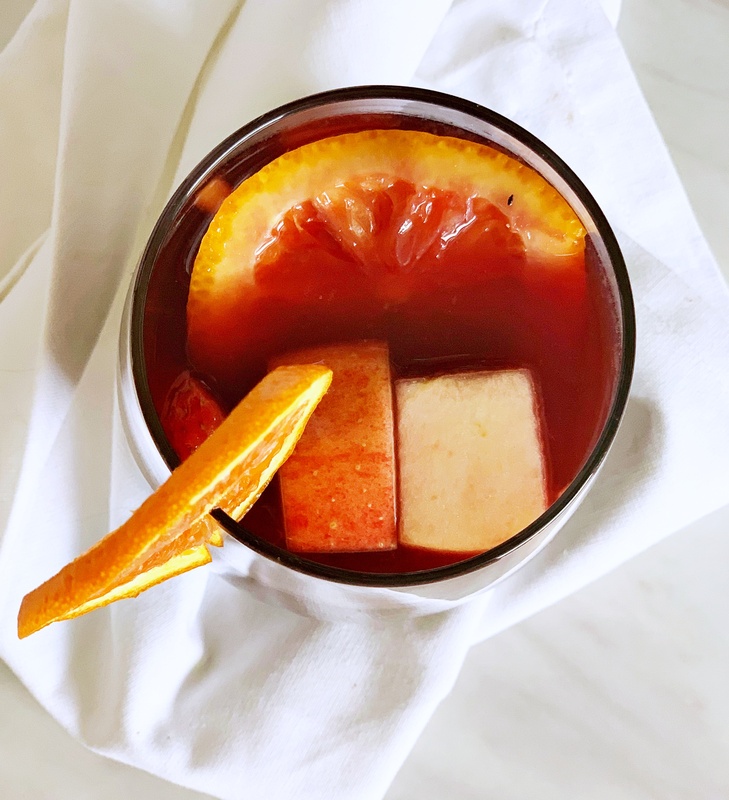 Now your sangria is ready to enjoy! Public service announcement: NO NEED TO BE A VEGETARIAN to totally fall in love with this eggplant lasagna! If my meat-lover husband can devour this lasagna in one sitting and not notice the meat is missing, then that tells me we’re in good shape for the blog! I used raw ingredients, that only required slicing, and baked them all together in a skillet (or casserole dish). There is no need to pre-cook anything or get out a million pots and pans (which means less dishes…yay!). Second, I didn’t want to use meat, or pasta, because I love eggplant and strongly believe it should get its time to shine every now and again! Therefore, I substituted pasta with sweet potatoes, and meat with our star of the show…eggplant! 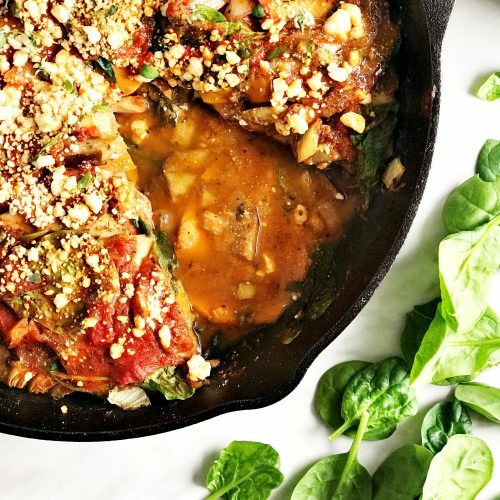 The sweet potato acts as a low carb substitute for pasta and gives the lasagna structure, while the eggplant provides high fiber content and is rich with nutrients (such as vitamins, minerals, and antioxidants). 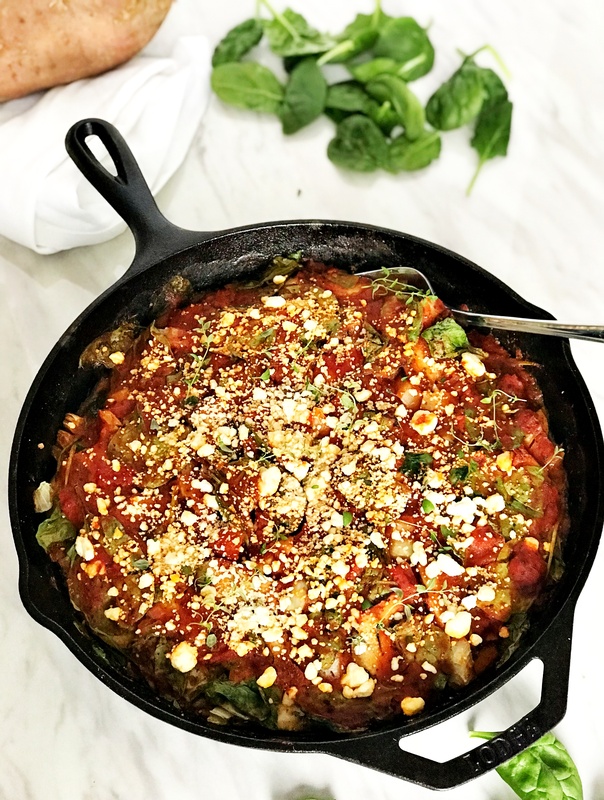 Instead of using traditional mozzarella, a cheese derived from cow’s milk that causes inflammation, I used goat cheese crumbles which contains less lactose and is typically easier to digest. Once all of your layers are assembled, cover in foil, bake for 50 min, then remove foil and bake for another 25 min. You can serve as a single dish, or with a side salad! 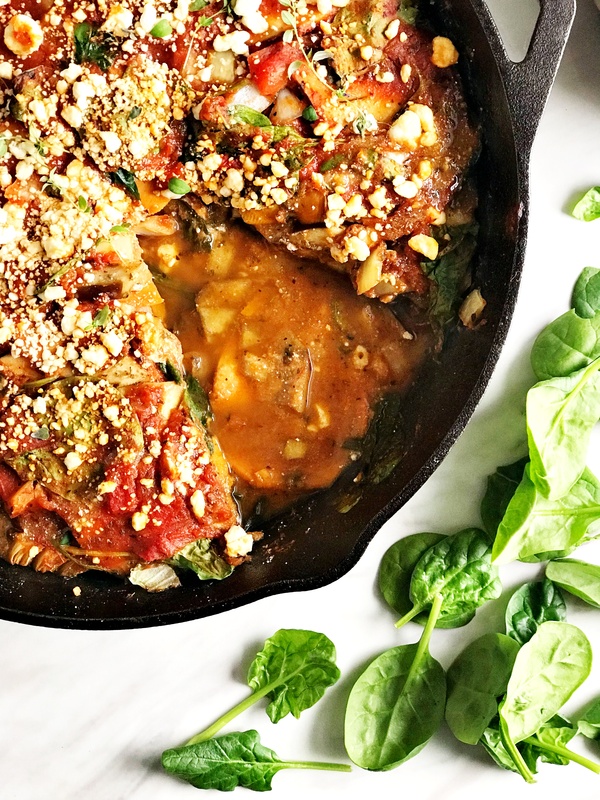 A one-pan, healthy, vegetarian, eggplant parmesan made with sweet potato, spinach, onion, and spices! Creamy goat cheese used in place of traditional mozzarella, on top of a basil marinara sauce. Preheat oven to 350 degrees F and grease a large skillet or baking dish. In a small mixing bowl, mix all spices and set aside. 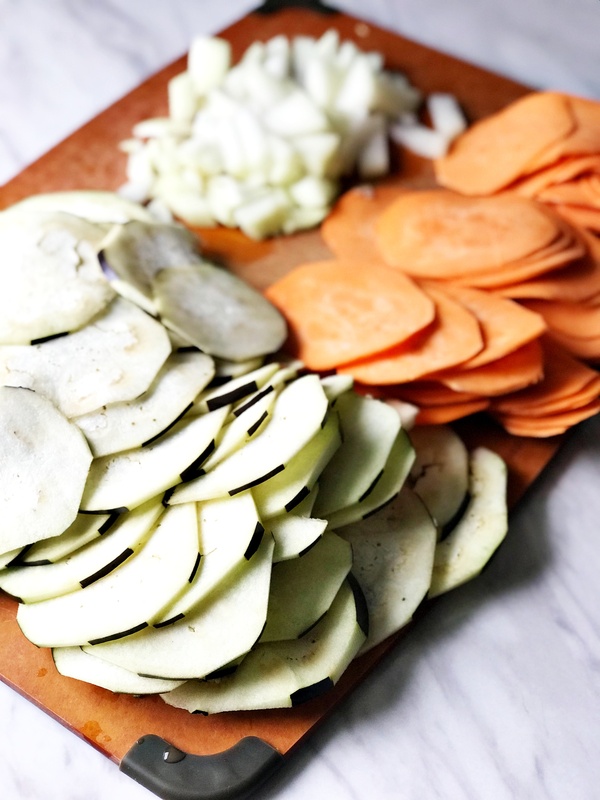 Using a mandoline, slice sweet potato into round, thin pieces and set aside. Using a knife, cut the width of the eggplant to approximately 1/4 in. thick, set aside. Chop onion and set aside. Take greased baking dish, and line the bottom with half the amount of sweet potato slices. Then layer half of the eggplant pieces directly on top. Take spice mixture, and evenly sprinkle half the amount over eggplant. Take half of chopped onion, and 1 cup of spinach and sprinkle over eggplant. Spread half of marinara sauce overtop and spread using a spatula. Evenly sprinkle half of goat cheese over top marinara. Repeat the same process again, starting with a layer of sweet potatoes. Wrap tinfoil over top and bake for 50 min. remove tinfoil and bake for another 25 min. Let cool, garnish with extra herbs (if desired), and serve!